Undulating frozen waves extend out well past the shore. The sound of water moving underneath this is eerily beautiful. It's been a full month since I last sat down to write about the ongoing ice inquiry in our class. 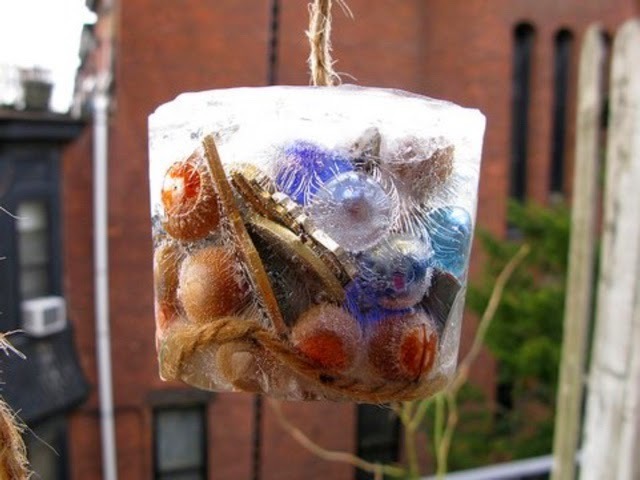 As I had described it in my last post, our students "were beginning to explore ice as a material, a phenomenon, and as a medium of artistic expression." Indeed, ice became a way for so many ideas to be expressed among a group of students whose fascination for the material rivals my own. As is the case in a large class with a curiosity-driven curriculum, ideas cycle around as groups of students follow their own projects, inspire others to join in or take over, or a new student moves into class and wonders about the documentation around the room. Our big ideas keep surfacing though the play keeps changing, a bit like fat that rises from a bubbling broth. Both inside the class and everywhere outside, ice has continued to be a fascination for many students. While at home on my own or with my kids, I've continued to explore the incredible scenes along the nearby shore as the ongoing deep freeze in February stretched into March and the local bay froze entirely for over a week. I was saddened by reports of starving animals and injured water birds, all affected by the intense cold for weeks without a thaw. I was fascinated by the daily changes along the beach where enormous ice waves formed, broke, and reformed into fantastical Dr. Seuss-like landscapes. I continued to collect interesting artifacts I found to share at school: icicles I harvested from the beach pictured above, frozen treasures such as apples or feathers found encased in ice, photos of winter scenes that made me wonder (such as the cluster of feathers below). Ducks working to keep a patch of water open over the frigid nights: life-and-death ice inquiry. Thousands of glittering shards of ice. A photo I took to share with the class. Soft downy feathers frozen to the ground. Great for inferring... ouch! As the calendar now indicates spring is here (hard to believe while the temperature hovers near the freezing mark), I get ready to head back to school after the March Break. Pooneh and I had ended our last week looking around our classroom, talking about what interests were fading and which new inquiries might develop as the indoor and outdoor environment change with spring. 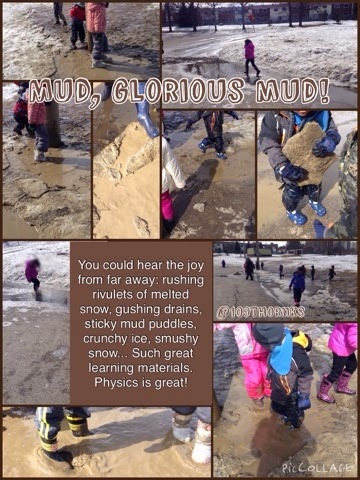 A few warm days before our break created a muddy puddle-wonderland on the schoolyard, one we explored whole-heartedly on the last day of school. I doubt anyone went home fully dry that afternoon. The laughter and exclamations of "Wow, look at this!" could be heard all across the yard. We followed rushing rivers of melted snow as they curved along the pavement to a drain. We found sticky mud that threatened to pull off our boots. We learned, again, that winter boots are great for snow but generally lousy at keeping water out. I wonder if that brief "big melt" will see an end to the interest in ice, if the wet and muddy landscape of early spring will lend itself to further exploration of water in its warmer form. "Our collaboration grew to include several classes and teachers whose communication with us helped our ideas grow. Indeed, the word "inspire" became a concept that spread to all we do in room 109. But that is a story for another post." Here is that story. It begins with a tweet from a teacher I admire, Aviva Dunsinger. Note: the response led in so many directions I captured what I could using the storify app. 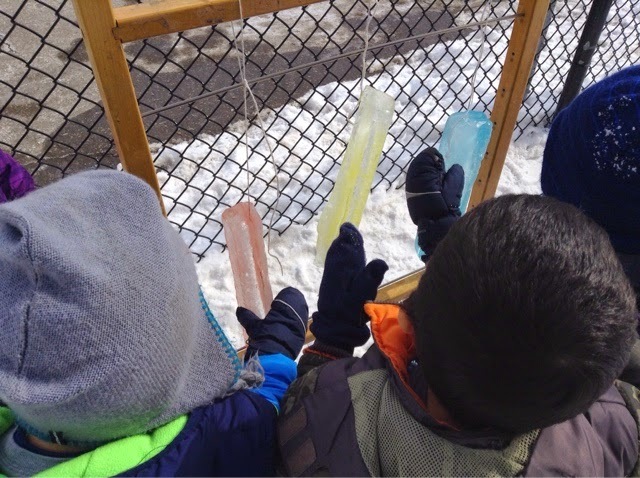 To see some of the related tweets shared with our families and followers, see: "Ideas about ideas: How our small group exploration of ice sculptures grew into a much bigger inquiry into ice, planning, learning from others, and metacognition."
. @109ThornKs Thanks for sharing your thinking and learning on Twitter! I teach Gr. 1, & I look at what you share, & you inspire what I do. I was touched by her comment but even more I was curious to know what the students would say, considering our previous conversations about where ideas come from. I shared her message during our morning meeting, and immediately students began to ask questions and make connections. @avivaloca thank you! We talked about yr tweet this morning. We are thinking about the word "inspire". Some friends are making you pictures. A collage we shared with families and followers in response to Aviva's tweet. Aviva read our responses, including the ones collected in the collage above, and responded with questions and more ideas for us to think about. 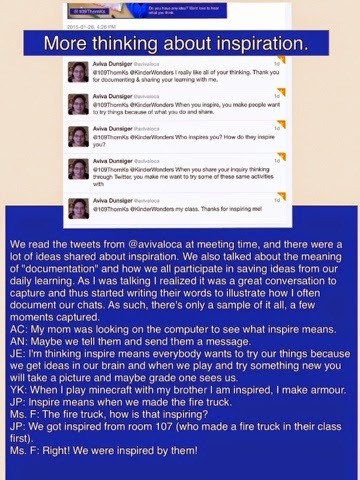 Note: we included our friends in @kinderwonders when we responded to Aviva, because they had been a part of our discussions about where ideas come from. @109ThornKs @KinderWonders I really like all of your thinking. Thank you for documenting & sharing your learning with me. @109ThornKs @KinderWonders When you inspire, you make people want to try things because of what you do and share. @109ThornKs @KinderWonders Who inspires you? How do they inspire you? 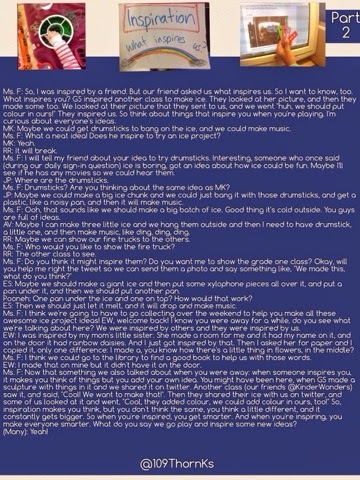 The next day at school we read Aviva's questions and comments about inspiration and documentation, and it lead to another great conversation about what it is we do when we share our ideas with each other. I was particularly thrilled to hear a student say her mom looked up the meaning of the word "inspiration" at home. Our families are such wonderful supporters of the learning that emerges from our class community. Below is just a sampling of what was said. I remember we talked for a while about the meaning of "documentation" before I managed to grab my clipboard and start recording what was said. Over the day I mulled over the connections students made when we discussed inspiration. I thought of how often Pooneh and I used a book, an artifact or image to inspire students. We do it all the time, but shining a light on our thinking made me think of my own inspirations. For creative interaction with ice, two artists come to mind. Andy Goldsworthy, whose ephemeral creations have helped me inspire students to explore natural materials for many years now including his works using ice and snow. In the last post I shared how AC was inspired by Goldsworthy's tree spiral to try her own "glued ice sculptures" both at home and then at school. The second artist is my friend Ranjit, whose creativity never fails to amaze me. He is first and foremost a sound artist, creating sonic wonder, but I can't help but admire the visual beauty of his works as well. 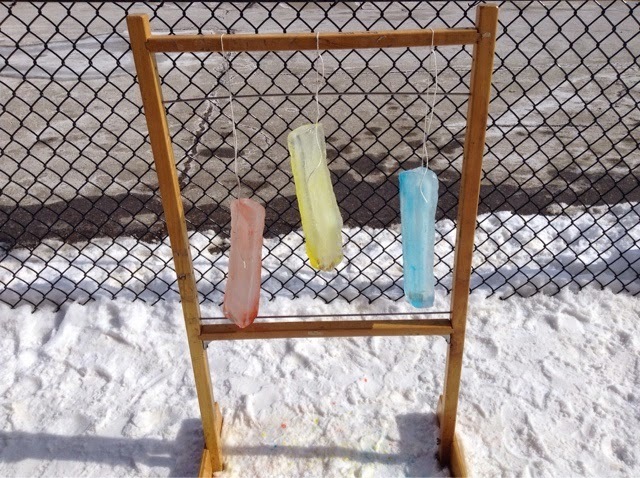 I have been making "noisy melting sculptures" for a few years now, so this intersection of #iceinquiry and inspiration seemed the perfect time for me to go back to the source. I knew I had to show the class the photo that started it for me. A playful ice sculpture made by Ranjit. I brought the pieces together at a morning meeting by reflecting aloud on how we had talked about inspiration, and how it happens in our class all the time. As soon as I flashed the photo on the screen, there was a buzz of excited chatter in the group. To be able to share how inspiration helps us, and then watch it unfold during play, was rewarding. The conversation about ideas just kept spirally around, widening to include more students and more ideas. Many big ideas were explored over the day, including light and shadow, body balance, balance of materials, simple machines (ramps), materials that change (ice and snow). My interest was piqued by two girls who disagreed about the value of play (included in the collage below). AV: Play doesn't make you smart, only work makes you smart. You have to sit and write. JP: Wait! We got smarter when we played with the blocks and we made the tower better together. 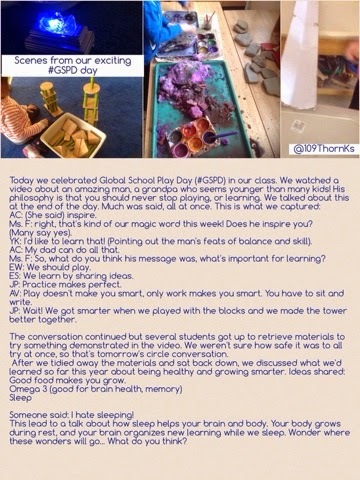 Now that is a conversation worth having with families, teachers, the whole school community... inspired by Global School Play Day and our philosophical talks about how we learn. Days like this, when so many students have a light in their eyes and a fire in their bellies to go explore an idea, these days I say we have raised windhorse together. Inspiration had become a part of the culture of our classroom. The next day, while students were again exploring body balance (as inspired by Steven Jepson's video shared for GSPD), ES saw AL fix a balance beam that he'd knocked over. He stood looking at AL for a moment, then it seemed as if a lightbulb went on over his head. 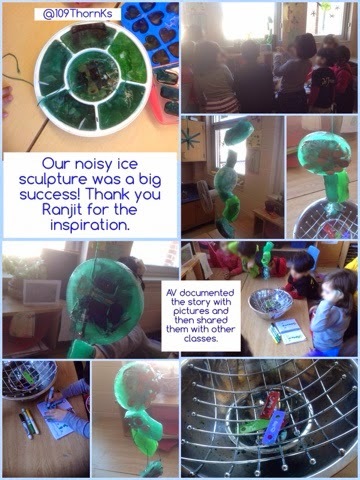 Our first musical ice experiments involved lots of metal "junk" loose parts, such as the keys we had spotted in Ranjit's version. Many plans were drawn and sculptures began to fill the freezer or the space just outside our doorway. Signs asking our fellow kindergarten classes with whom we share our yard went up: "Please don't touch!" and the universal "NO!" hand sign. Students hushed to listen for the next "clang!" of something falling from the melting sculpture. AV looking closely, carefully documents all the elements she sees in the experiment. Many tweets and vines went out that day, with students asking us to share their drawings or take pictures of their favourite angle of the melting ice. Students were delighted later to find that Ranjit was likewise inspired by our playful experimenting. 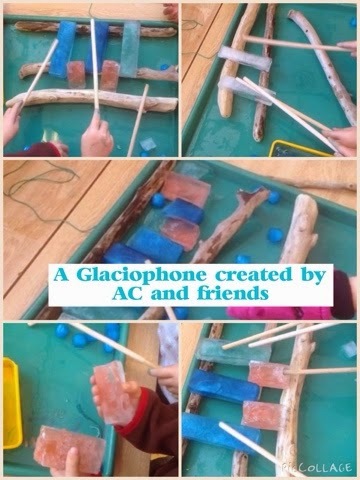 AC was so inspired by Ranjit's video of the "glaciophone" she quickly drew up exactly what she'd need to recreate her own, but also added her artistic touch by including colour for the ice bars. 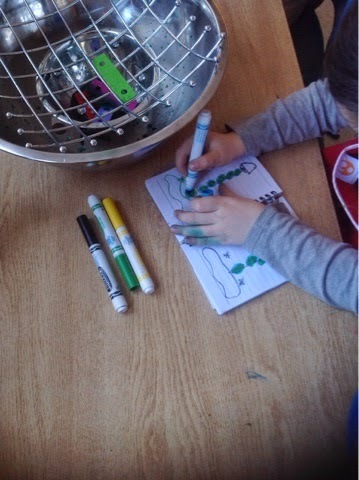 This is engaged learning from a JK student. AC's ice bars and a few more ice experiements, fresh from the freezer. The beautiful result of the ice bars "glaciophone". Meanwhile, our excited sharing was beginning to catch others' attention, both in the schoolyard and in classes we follow on twitter. We were inspiring others with our ice inquiry. We were beginning to see exactly how big an idea can get, by sharing it and opening our minds to new ideas, daily. @109ThornKs Melina wonders if you are going to hang them, she thinks the little blue ones will melt faster than ours. I was impressed that this student made a prediction about what would happen... to another class's ice experiment! We tweeted her a response to say how we liked her observation and prediction. 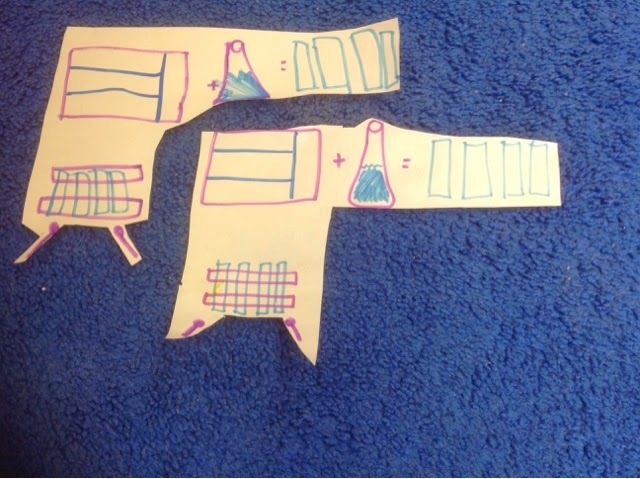 It led to a good conversation, and their following tweet (below) inspire several students to include new materials seen in their pictures, such as buttons and feathers. Our class continues to have great communication with our friends in KI Wonders, so this tweet made just about everyone sit up a little straighter and smile at our welcome circle. 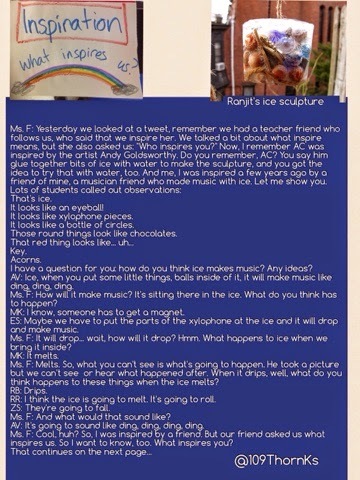 @109ThornKs @ranjit our class likes reading about your ice inquiry!! You give us lots of sparks! 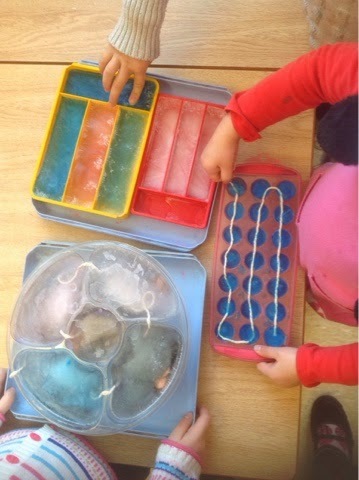 @109ThornKs Ss wanted to make ice sculptures so we looked at a lot of yours for inspiration. Thanks! EW, a part of the ice inquiry projects as far back as November, was thrilled to help out by offering a new idea to their class. She carefully wrote up plans, not for her this time, but for their class to try. Procedural drawing in Kindergarten. We do that, too. Another wonderful thread developed when I was chatting with educator friends @AnamariaRalph @Bartlettkinders @MissJules1010 @inostribimbi about ice inquiries developing in their classrooms. This wasn't seen by our class (or families because I was using my own twitter at the time), but I knew I had to share these images with AC, who so loved Andy Goldsworthy's technique for building with icicles. When a tweet like those above came through, I shared them with the students whose creations had prompted the others to respond. There were many more, with the students commenting back and forth about what they saw in their peers' creations, comparing and offering words of encouragement to each other. (those below are included in the larger storify link). 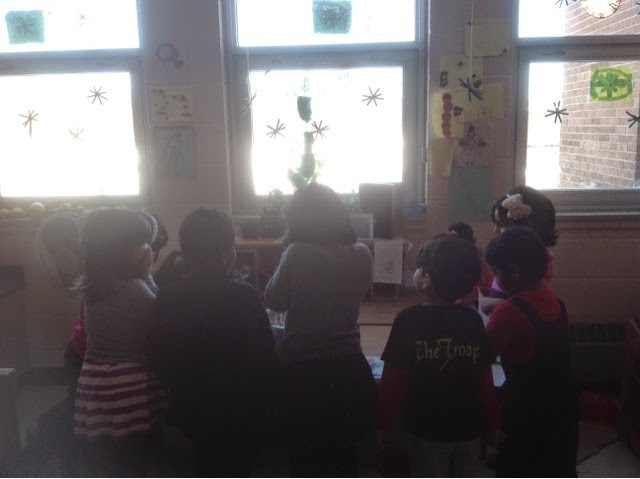 Just down the hall, indeed at the far end of our large Kindergarten pod, Ms. Duric and Ms. Azzopardi's class were also exploring the beauty of ice as an instrument. We found these intriguing hanging bars outside one day when we went outside. I was most impressed by how gentle and respectful these students were, even as they were fascinated by what they found. 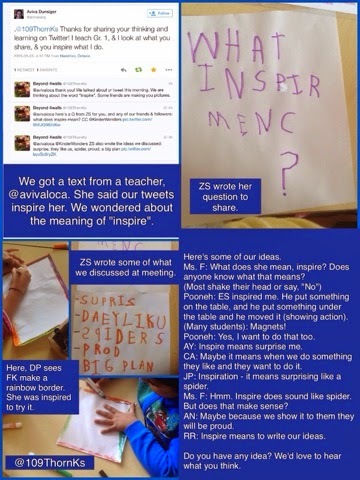 Also online, their class tweets were showing a similar fascination with #iceinquiry. Several video clips caught my eye and I shared them with the core group of ice inquiry experimenters. As can be seen from this long list yet small glimpse into the entirety of ice inquiry, freezing water and observing it can lead to some unexpected learning for all involved. Indeed, when our class welcomed Miss Shazia (an ECE student completing her practicum teaching in our class for two months) looked around for ideas for an invitation, she naturally included the ongoing inquiry into her plans. Aviva, I can't thank you enough for sparking the use of the word "inspire" in our class. You inspire us, and all the other classes and teachers in this part of our #iceinquiry story, you make our learning so much more interesting!